Our installation team were up and onsite early last week, as we paid a visit to one of our Bolton customers to fit ten dry-wipe noticeboards to help with their workflow and productivity. Our installer Lee was keen to get the job completed, making great use of our customer’s large stretch of bare wall, and putting some nice finishing touches in along the way. Besides the custom print and the design aspect of this dry-wipe board (we’ll get to that later), this board was fitted with brushed aluminium fixings to give it a premium look and feel, perfect for a setting where you might have external customers or visitors walking around. 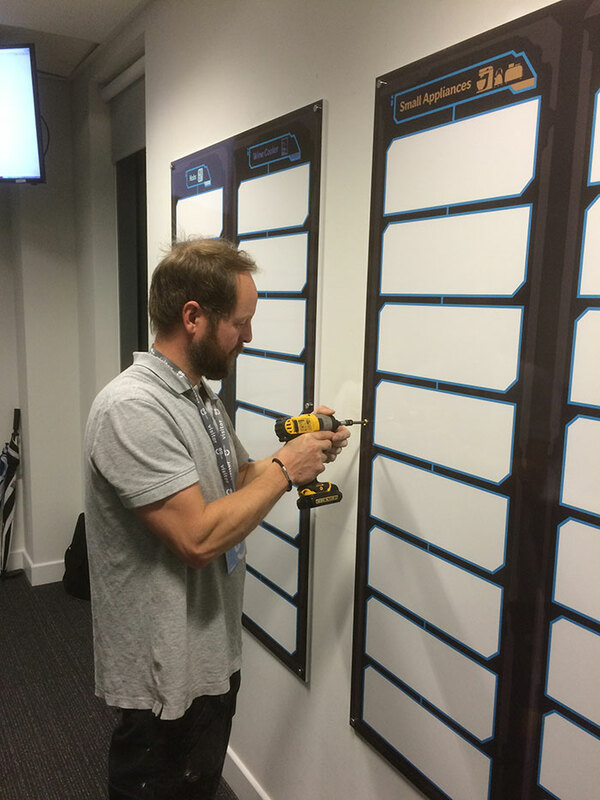 A dry-wipe board is a multi-tool for business and home use, they can serve as as timetables, workflow organisers, or just somewhere to jot down quick ideas when inspiration strikes. The beauty of the dry-wipe boards we create is that they can be custom built for your needs, as you can see this particular customer wanted something that reflected their product lines, with each whiteboard detailing a different line. With this design, they are now able to utilise the boards for processes and timelines specific to these products, and the visual nature of the headings means that productivity can be increased by creating less mess and chaos usually associated with scraps of paper and frantic note-jotting. Of course, your dry-wipe board may have its own requirements: maybe it needs headings for sports club scores, areas to stick photos to, or maybe it just needs a personalised colour-scheme! Whatever the layout is, it can be effectively made into your custom dry-wipe board. Need Something Similar Fitting For Your Business? If you think a dry-wipe board or a similar type of whiteboard setup would benefit your workplace or home, give us a call on 01942 729548, we’re happy to talk about your requirements. Alternatively, send an email to us here and we’ll get back to you as soon as possible.